Factions Friday matches begin at 5:00 Pacific time. 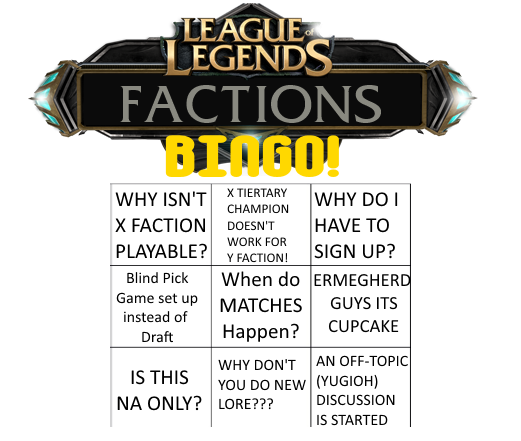 To get in on a match, join the Factions chat in-client, and also join your faction’s chat. If you’re new to Factions, you may find the Beginners’ Guide helpful. When you’re ready, you can sign up for a faction here. To see which Champions are available for which factions, view the Faction Rosters. Today is our sixth Factions Friday event. Factions Friday is a recurring event designed to facilitate match creation, with a secondary focus on recruiting new Summoners and helping them get oriented. Although Factions is designed so that anyone can start or join a match anytime, sometimes that openness can make it difficult to arrange matches, as nobody knows for sure when others will be around and wanting to play. The idea of Factions Friday is to designate certain days and times as focus points for match creation. If you’d like to play some matches, show up in the Factions chat (and join your own faction’s chat, e.g., “Noxus”) and prepare for battle on the Fields of Justice. As for starting a match, here is my famous CupcakeTrap recipe. Holler in Factions chat. Say you’re going to make a match. Tell people to join their faction-specific chatrooms, e.g., “NOXUS” for Noxians. Join all three chatrooms yourself. Pick the two factions with the most available people. Create a match lobby. Invite everyone from the two chosen factions. If the room doesn’t fill up immediately, go to the main chat and invite EVERYONE. Look at your friends list. Message people to ask them if they want to try out a Factions match. Or just invite and explain once they hit the lobby. Once the room is almost full, ask subs to identify themselves. Have them swap around to improve rank balance if they like. If there’s an overflow of “real” Summoners for a faction, politely ask the subs if they’d mind switching to the other side or stepping out. When the room is truly almost full, move to spectator. Tell the new owner to start when ready. Call them out by name; they may not realize they’re the owner now. Make sure everybody has the roster link. Tell everyone to HAVE FUN. Set a good tone. Remember: Factions is supposed to be fun. Make sure they know that it’s the winning team’s responsibility to send in the results, to get points. Once the match is started, go back to the lobby and start another match. Even better: find a new person who’s asking for a match. (You’ll see them in Factions chat.) Tell them you’d like to help them make a match. Walk them through the process. Have them do things, but back them up. Teach a yordle to bake cupcakes, and you contribute to stereotypes about yordles and cupcakes for a lifetime. I really, really want to reward people who start matches and recruit Summoners. I hesitate to say anything formally just yet, because I have other favors to pay back first. However, I assure you that your efforts will be noted. Factions Friday is also meant to make Factions more accessible to new people. It’s a good time to recruit friends to join you for a match or two. Please be patient with newer Summoners who are still learning the ropes, and remember: though Factions can get a bit tryhard at times, at its core it’s meant to be fun and somewhat lighthearted. I strongly recommend some vaguely in-character all-chat banter to keep matches positive. Besides, why go with some tired solo queue line like “omg wtf noob” when you could instead be proclaiming, “Noxian fiends! You shall not triumph over Piltover this day!” Or if you’re Summoning Orianna to the Fields, go ahead and do some creepy robo-speak about “Let’s-play-with-Baron. It-will-be-fun.” Those Summoner-Champion mindlinks can be really trippy. RaptorAttacks, Lead Raptor for Recruiting/Community, has set up a pair of discussion threads. You’re encouraged to stop by and assist with answering new people’s questions. EDIT: Wow, guys. Raptor did it.